One of the three 2018 Apple iPhone models went through the Geekbench benchmark test late last month, and the test revealed a few interesting things. One, the A12 chipset, manufactured by TSMC, features six-cores just like the A11 does. Two, the model that went through the test will carry 4GB of RAM. Currently, the iPhone 8 has 2GB of RAM while the iPhone 8 Plus and iPhone X both carry 3GB of RAM. While some Android phones use as much as 8GB of Random Access Memory, the optimizations in iOS allow it to use less RAM to function smoothly. We must point out that it isn't clear how many of the 2018 iPhone models will have 4GB of RAM inside. We would guess that at the least, the 6.5-inch Apple iPhone Xs Plus would have that much RAM. For those not familiar with Random Access Memory, it is a short-term memory chip that holds data used by active apps. The more RAM your phone has, the smoother your multitasking experience should be. The original Apple iPhone had 128MB of RAM on board. The rest of the benchmark test revealed a multi-core score of 10,912 and a single-core score of 4,673. Apple is expected to launch three new iPhone models this year including an Apple iPhone X sequel with a 5.8-inch OLED display dubbed the iPhone Xs. The iPhone Xs Plus will be a monster of a phone sporting a 6.5-inch OLED panel. And the unit that Apple expects to sell the most is reportedly named the iPhone 9. This will be the lowest-priced model among the trio, and it should be equipped with an LCD display and only one camera on back. It will not come with 3D Touch because of an extra layer that supposedly will be applied to the screen. The trio should be introduced in September. With nothing confirmed about the A12 but this this probably fake benchmark and barely a month of iOS 12 betas, how do you know all this for sure? Could you let me know the lottery numbers for Saturday? Even if it's fake, at least it got geekbench link as source, unlike other fake that's just based on picture in chinese site. To me it seems to be a higher clocked A11, rather than an A12, so maybe this result is connected to the cheaper iPhone model that won't be getting an A12 SoC. Or maybe android got better ? Just get an iPhone or some other Apple product so you can indulge your obsession with all things Apple. Catch up with A12… lol ? Keep those benchmark wins while Android racks up the speed test wins. Android's are literally beating Iphones in actual real world tests and speed tests again and again. You can keep the geekbench wins, which has proven to be inaccurate of real world performance (Exynos 9810 vs Snapdragon 845), as compound tests are all won by Androids as well. They fattened up the L2 Cache and got rid of L3 iirc. It's kicking tutu, well done Apple. 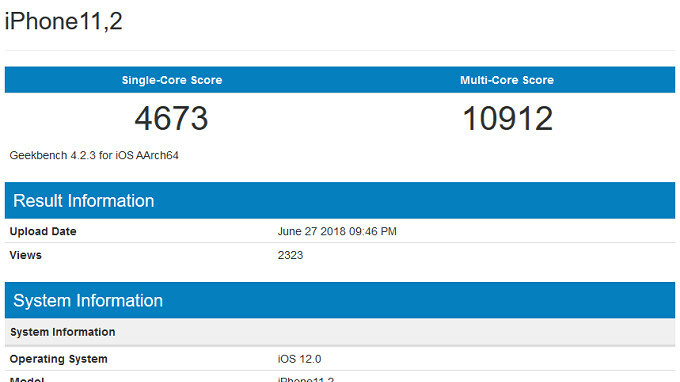 So, same score as as sd 855 on multi geekbench. Right on, nice. I was unaware the 855 was rocking some too. Love it, wish it was in phone production now rather than next year type of thing. Samsung puts in 6gb if ram and it still lags. Apple uses 2gb and it’s smooth. More RAM doesn't do anything for smoothness. Really? So why have iPhones been adding more RAM and increasing their CPU cache sizes? More RAM increases multitasking performance, more cache increases compute speed. Please direct to the speed tests you've been watching please. The ones I've seen shows iPhones being left in the dust, so I'm not sure how it was lagging and still first in the test. You don't seem to have a clue about the meaning of 'lag'. Lag and lagging behind are totally different things. What a bunch of rubbish. You need to get your Apple fanboy head out of 2014, as Samsung smartphones doesn't "lag" in 2018. You haven't owned a Samsung smartphone recently, as you clearly don't have any idea how they actually perform. That says alot about Android. Apple hardware is designed to work flawless on iOS. iOS is why people buy iPhones. "Apple hardware is designed to work flawless on iOS. " Translation - we lack apps and features Android has, so we run on phones with less ram and CPU cores. "iOS is why people buy iPhones." Translation - we were right when we said phones don't need screens bigger than 3.5 inches. Believe us again when we say iOS is a superior OS. And few years ago i said i wouldn't ever need bigger TV than 60" and now i want 78" What's your point? People can't change their opinions when world is changing? What happened to phone needs physical qwerty because no-one wants to use touchscreen qwerty? let me correct..."apple logo is why people buy iphone". That's also true, thats called brand name, people know what they get when they buy Apple logo, they know the product will be great. Apple logo was reason why i tried iPad, Apple logo was reason why i bought Apple TV. Based on how great the iPhone was i trusted that iPad is too and gave it a chance. So yes people kind a buy Apple logo, just like they buy certain car brand, tv brand, speaker brand etc. They know quite well what they are getting. So you just admitted how crappy Android is, thanks for the honest comment, but we already knew that, that's why we choose iOS. I have no idea what you are talking about, iPhones been smooth since first iPhone.